I adored The Magic Garden with Carole and Paula. This children's show aired from 1972-1984 on WPIX, channel 11 in New York. If you're a parent of older kids, you may remember Nick Jr. aired reruns in the early 1990s. I recall, as a little girl, thinking my mom looked so much like one of the hosts Carole Demas -- she has the lighter, longer hair. This may have contributed to my deep love for the show. I adored the songs and the stories. I was in awe of the Chuckle Patch that grew silly jokes and the flowers actually giggled. Characters such as goofy Sherlock, the wacky pink squirrel and his buddy Flapper the bird were perfect additions to the cast. I loved the Story Box, a great, big colorful chest that provided Carole and Paula with magical felt props and simplistic costumes. The only thing about The Magic Garden that I didn't like was that Carole and Paula would say a personal hello to viewers. Much like The Magic Mirror on Romper Room, my name was never mentioned. Such a wonderful show for kids. Here are some videos to jog your memory. 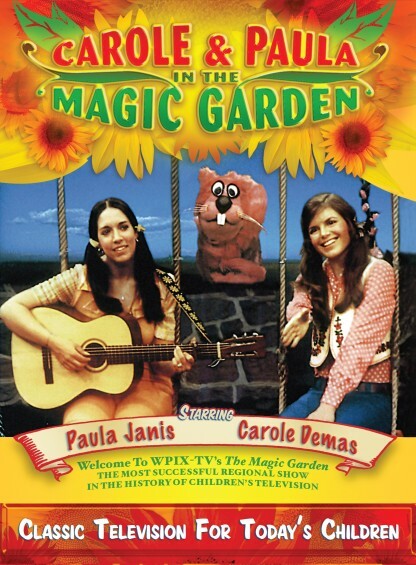 The Magic Garden is available on DVD and if I had a kid, I'd totally share it with them. I think it's way better than any of that newfangled Gabba Gabba garbage kids love today. Check out my YouTube video of their performance at the Wyckoff YMCA (featuring Sherlock) at http://youtu.be/aGta1IU7EnU and the photo album at https://www.facebook.com/media/set/?set=a.1725558732341.95131.1039582076&type=1&l=d67c766c94. I was never in the Magic Mirror on Romper Room either. I never saw The Magic Garden, but I know they wouldn't have mentioned me. Nobody loves me. Everybody hates me. I'm gonna eat some worms. Hmmm... My page closed in mid-comment.